Here is an email that will trick tons o' folks into clicking their way into malware hell. Dropbox is a popular site and application that facilitates sharing files among various users or multiple machines of a single user, as well as acting as a cloud-style place to tuck away backup copies of files that are important to you. The company's blog claims over 300 million users around the globe. 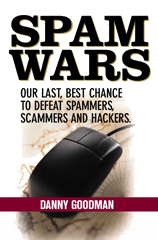 There's a good chance that a spam splatter will reach a lot of users. So, the email claims to be From: Dropbox (although the Reply-To: is to a canned gmail address, so Dropbox won't immediately be alerted by a raft of bounces from bad recipient email addresses that litter every spam list). The Subject: line is the innocuous "Please verify your email address." 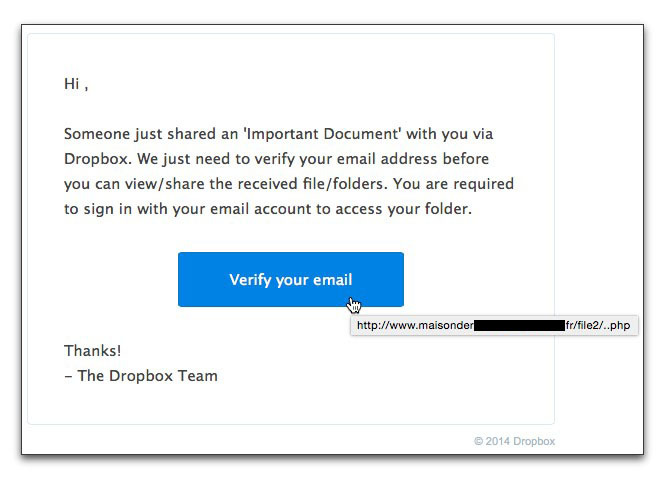 In their haste to be sure their Dropbox accounts don't crumble so they can retrieve the mysterious "Important Document," many recipients won't take a few extra seconds to roll the cursor atop the button (or tap and hold on a touchscreen device) to reveal the true destination of the link (as shown above, partially blocked). Such links invariably lead to malware installation pages. And all that secret stuff you keep in your Dropbox folder may no longer be secret.